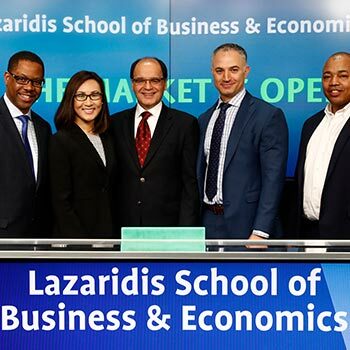 On March 21, Hamid Noori, Lazaridis Executive Master’s in Technology Management (Lazaridis EMTM) executive director, joined Micheál Kelly, dean, Lazaridis School of Business & Economics and Eric Sinclair, president, TMX Datalinx and Group Head of Information Services, TMX Group to open the market in Toronto. The event was in celebration of the Lazaridis School’s 50th anniversary. Four current Lazaridis EMTM candidates also participated in the opening: Joe AbiDaoud, vice-president IT, CIO, ‎Yamana Gold Inc.; Ophelia Chang, audit manager, Technology Infrastructure and Security, BMO Financial Group; Donald Desmond, senior manager application development, Compass Group Canada; and Steve Lemonius, vice-president Operations, Oticon Canada. The Lazaridis EMTM adheres to the School’s mandate to prepare students to be adaptive thinkers. The 11-month, part-time management program emphasizes high-level executive training and develops leaders to be successful in a high-speed, high-cost, high-risk global environment.